Today I thought I would bring you a Top 10 under £10, where I talk about my favourite then things for under a whopping ten pounds. 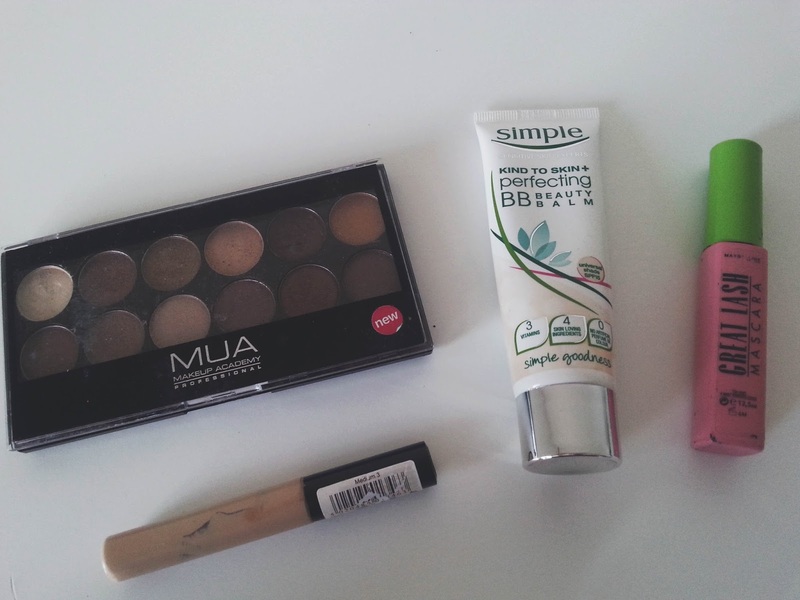 This post is all about my fav beauty items, and who knows maybe more of these in the future?! 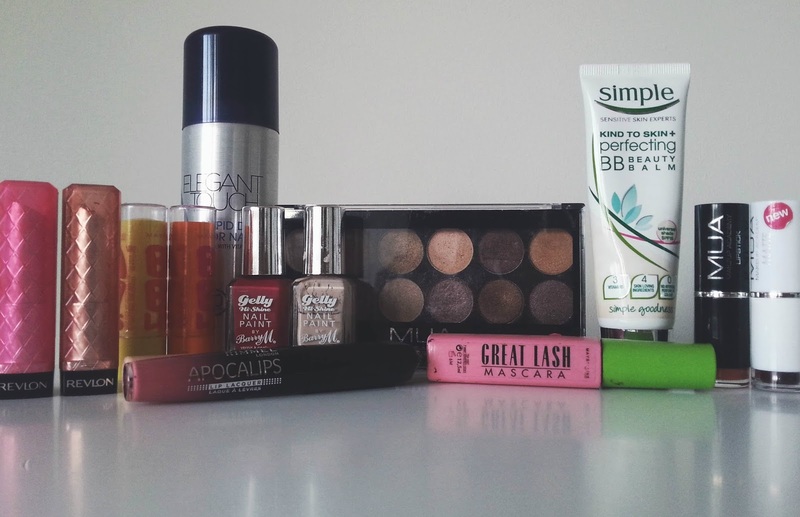 It was so difficult to pick just 10 items as I am a big drug store fan and love anything that is under £10, but I managed to narrow it down without repeating a lot of things. MUA Heaven&Earth Palette - This was the first eye shadow palette I ever purchased. The new sticker just shows how long I have had it for as I bought it when MUA first started up in Superdrug stores. I love the shades in this palette! Very neutral and great for every day, they are also very pigmented and last a long time with some primer on underneath. I haven't bought any of the other MUA only eye shadow palettes (par the artiste one which has bronzers and blushes in it) because I don't want to forget about this one. Collection Concealer - The best thing I have ever bought, this was taken when I was just about running out and recently featured in my empties post a few weeks back. I love the coverage this stuff gives, and find that it is the only concealer I can use for my blemishes and that it doesn't dry out or look really flaky. Simple BB Cream - This isn't a very talked about product because it isn't really something you associate with as Simple is a skincare brand. But when this launched, I had my eyes set on it because I knew that I would most probably fall in love with. And boy I did. At first, I really didn't like it as it only comes in one universal shade that claims to match any skin tone - but then after finding different ways around it...I love it and it just squeezes under the ten pound tag. Maybelline Mascara - I find this mascara to be the one for me. It does everything it needs to and more. Why? Well because it lengthens whilst adding volume to your lashes and makes them look amazingly natural. I prefer the waterproof formula over the normal as the normal is very drying. Revlon Lip Butters - One of the best ways to add some colour to your lips, the shade range for these things are amazing and if you haven't tried one yet I seriously recommend them. They are very moisturising and give your lips colour whilst looking normal. If that makes sense? Maybelline Baby Lips - These things are so two sided, because some people hate them and some love them like me. I like using them on my lips at night time because I wake up with all the dryness gone and they feel soo soft. I also love the tinted ones if I am having a lazy day to make my self look a little more presentable. 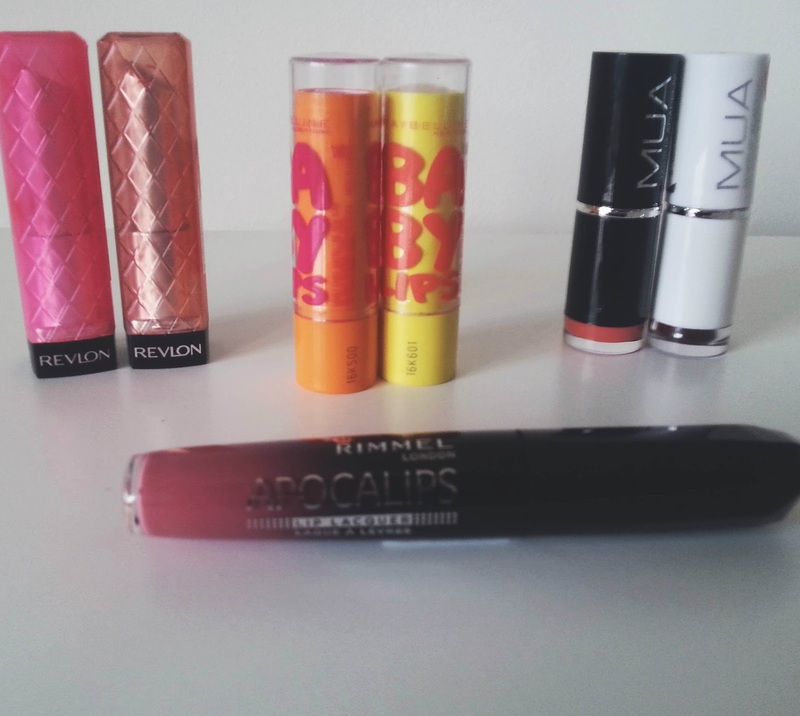 MUA Lipsticks - The cheapest things in this whole post. These lipsticks retail for only £1 and in my opinion will be the best pound you ever spend. Even though I find that they don't last very long on the lips, they are very pigmented and so moisturising. The recently launched Matte ones are also great however there isn't a very big range of colours to choose from. Elegant Touch Nail Spray - A recent discovery of mine and one that I have not regretted at all. This is the spray version of a rapid drying top coat, it is much cheaper than buying all this seche vite business and will dry your nails quicker than you can say super cala fragilistic expialidocious. The oily residue that is left over may annoy you at first glance, but if you rub it into your cuticles you are good to go. BarryM Gelly - Who doesn't love these? If you are wanting to get that salon manicure gel effect thing at home then seriously go and invest in a few shades of these gelly formula nail polishes from barrym. They are rapidly becoming my addiction and you can see the one on the right 'Lychee' is by far my favourite shade. I am always reaching out to paint my nails with these babies because they are so glossy, long lasting and have amazing colour payoff. I love MUA's eyeshadow palettes. I love the heaven and earth paletter. You should try the undressed me too. It's my favourite.